If a dentist is not careful during removal of your child’s lower wisdom teeth, nerve damage can result. Negligent extraction is not the only possible cause of nerve damage, dental anesthetic injections (nerve blocks) are one other cause, but extractions are the most common cause of this injury. The lingual nerves connect the brain to the sides of your child’s tongue. Damage to these nerves can result in anesthesia (numb tongue), paresthesia (tingling), or dysesthesia (pain and burning) in the tongue and inner mucous membranes of the mouth. An injury to the lingual nerves can also result in the loss of the ability to taste. 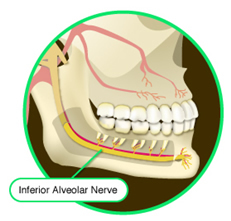 The inferior alveolar nerves (sometimes also called inferior dental nerves) connect the brain to the chin, lower lip, and jaw. They can be injured by tooth extractions, root canals, and the placement of implants. These types of injury may effect your child’s appearance, his/her ability to speak, drink and eat. Loss of sensation in the tongue may make it difficult for your child to know what they are eating (and when it is time to swallow) and may alter how food tastes to your child. Corrective surgery is available but may or may not be successful. One procedure involves taking a nerve from your child’s foot or ankle to try to repair the damaged oral nerves. If surgical repair fails, your child may be left with permanent nerve damage.